E+O, with the generous support of the Cisco Foundation, has rolled out a mobile platform that enables two-way communication with our clients, and those of our partners. We can send and receive messages about education and training opportunities; housing maintenance reminders; payment reminders from financial institutions; community and awareness building initiatives; health and disaster warnings; and more. The only way that we can disseminate information at scale, and close the communication loop with our clients, is through technology. Indeed, anyone wanting to communicate in the developing world needs to embrace mobile technology. 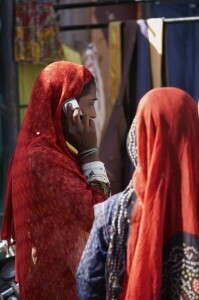 In developing nations, just over 90% of all people have a mobile cellular subscription, while only 10% have a landline. India, our first target market, has the fastest growing telecommunications network in the world, with 904.5 million cell phone accounts (and only 28.5 million landlines). In most developing countries, smartphones are still out of reach for most mobile consumers. In India, only a little over 3% of all cell phones are smart phones. Among E+O’s low-income client base, email use is extremely rare, and SMS messages are also unpopular, due to the charges associated with them. In fact, our market research has found that cell phone users are actually reluctant to simply place a mobile phone call, because of the costs associated with doing so (India’s cell phone subscribers spend an average of just $3 per month). Instead, low-income Indians use the “ring once, hang up” system to signal that they want to communicate (they incur no charges when they receive a call). One study found that half of all Indian cell phone subscribers used missed calls to communicate. As a result, E+O developed a missed-call platform that places a call to target clientele with a recorded message, and provides a missed-call back number for more information. A live person then calls the client directly to answer any questions. Early results found more demand than E+O had space for our safe construction training sessions, which were only publicized via the missed-call platform. Our partner financial institutions and other NGOs see enormous potential in this platform for two-way communication on a variety of initiatives.